Very late afternoon in Chobe. Elephants cool off after a hot day. As with many rivers in Africa the Chobe River showcases a place of many contrasts during the seasons, for here is a place that provides a lifeline for the greatest concentration of Elephants on the continent. The legendary Chobe River is a place of great diversity, especially during the dry season when the wildlife gathers along the river's edge in numbers bordering on the unbelievable. The dry season is a harsh time in northern Botswana and there is a constant struggle to survive. The colours of the sky are also a study in contrasts during the year, with the beautiful blue skies of the early dry season becoming increasingly grey with dust and smoke as the season wears on. Rainy season skies are washed in blues and colours of white of the rain clouds. 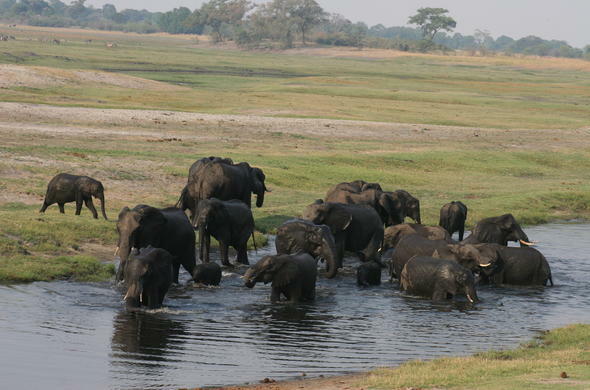 My most vivid memory of the contrasts in the seasons was during a safari I was conducting through the parks of Botswana in the late dry season, and when we arrived on the Chobe River the elephants were out in their usual numbers. During the night the first rains of the season fell on the northern wilderness and the elephants dispersed, literally overnight. We did not see a single elephant the next day. It was difficult explaining to my fellow travellers what had happened. During the dry season the water dries up in the hinterland and the animals move closer to the water, and although there is still food in the vast wilderness there is no water. Close to the river however the vegetation is stripped bare with all the animals concentrating near the water. This contrast is dramatically illustrated from the air where it can be seen how barren the land around the permanent water sources is whereas the interior still has some vegetation covering but no water. It also seems from the air that the animals are concentrating in the areas where there is no food. During the rainy season when the animals have dispersed the contrasts are just as fascinating with the vegetation around the river having recovered into a lush green carpet embracing plentiful water - but the animals have disappeared.